THQ's uDraw tablet tanked on the Xbox 360 and PlayStation 3, but analysts say that in itself isn't enough to explain the publisher's dramatic sales shortfall. THQ cut its third-quarter sales forecast, originally announced at between $510 million and $550 million, by a stunning 25 percent yesterday, placing the blame for the slide squarely on the shoulders of the uDraw GameTablet. 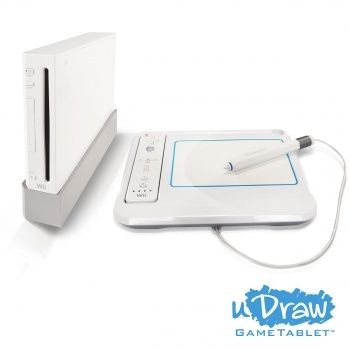 "Despite uDraw's strong success on the Wii in fiscal 2011 and market research indicating strong demand for uDraw on Xbox 360 and PlayStation 3, initial sales of our uDraw tablet and software on these high-definition platforms have been weaker than expected," THQ President and CEO Brian Farrell said in a statement. It's never good when a game tanks, but analysts say that THQ has bigger problems than just a single bomb. "Management blamed poor sales of uDraw on the Xbox 360 and PlayStation 3 for the miss. However, the $130 million revenue downside suggests that there was likely some incremental weakness elsewhere," Cowen & Company declared. "At a roughly $50 for uDraw across all platforms, including the Wii, it would take a 2.6 million unit shortfall to account for the full revenue miss; THQ's planning implied less than 2.6 million units of total uDraw sell-in." Furthermore, according to Wedbush Morgan analyst Michael Pachter, the big cut in third-quarter guidance means THQ likely won't be able to meet its financial targets for the 2012 fiscal year, making it the fourth year out of the past five that the publisher has finished with a loss. He also echoed the belief that THQ's woes go well beyond just uDraw. "We believe sales were lower-than expected for many titles in addition to uDraw, due in large part to a pattern of mediocre reviews and a very crowded release slate for the videogame industry," he said. "Reorders were also likely below expectations as the company's release slate over the first half of the year was pretty thin apart from Warhammer 40,000: Space Marine." Things aren't looking much better for 2013 either. "Given its declining licensed and core properties [apart from Saints Row] and an uncertain release schedule next year, we remain unconvinced that FY13 will be profitable," he said, adding that the company's cash balance could "become an issue" next year as well.